Notorious hacker group Anonymous took credit for shutting down the city of Cleveland’s website Monday, prompting an FBI investigation, Cleveland.com reports. 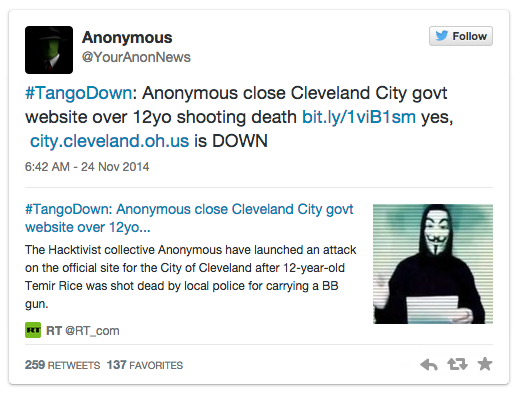 Anonymous said the website was hacked in response to the police shooting of Tamir Rice, who was killed Saturday while carrying an airsoft gun. The website was still down Tuesday morning. “The city of Cleveland and our website vendor are reviewing the incident and determining proper preventative measures to be added in order to ensure future attacks are thwarted,” city spokesman Daniel Ball said. “Police of the United States you will learn in due time once anonymous has shut down your sites that we will not stand for your ignorant untrained rookie cops,” the message said.